Ray's therapy ends up being at odds with Sam's power struggle on Ray Donovan. "Shabbos Goy" is the fifth episode of the show's fifth season. 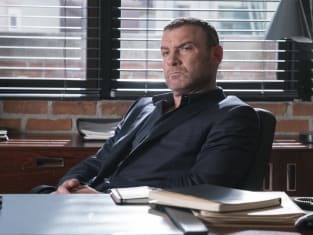 Ray Donovan Season 5 Episode 5: "Shabbos Goy"
Here's to you and me and the beautiful mess we made. Permalink: Here's to you and me and the beautiful mess we made. Ray: He wants two million dollars and your husband's Oscar. Sam: I hope you're joking! Ray: That's what he said. Sam: I'll pay him the money, but no Oscar. Ray: That could be a problem. Permalink: I hope you're joking!